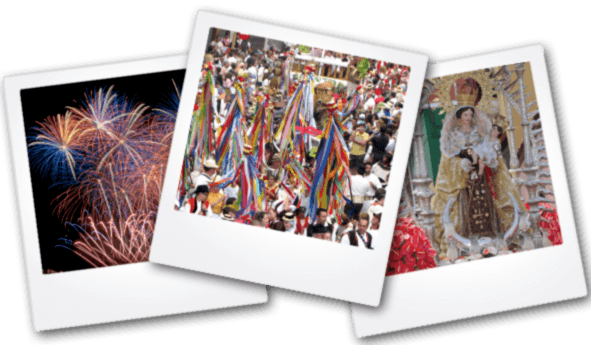 The religious procession (romería), which was declared of interest to Tourism, marks the end of the May celebrations and the largest event of all. It is here, as the crowds gather, that the identity of the people of the town shines through. There are folk music troupes from each of the seven islands, ornamental carts pulled by oxen, decorated agricultural vehicles, and people dressed in the traditional folk clothes (magos). The procession travels 2km, accompanied at all times by live music and folk dancing. During the procession, the food and drink that is being carried on the carts is shared with the crowd and with tourists. The typical food on this type of procession includes: boiled eggs, boiled potatoes, kneaded gofio, bananas, roasted meat, and good wine. Thousands of people gather in the municipality for this event. The participants, both in the parade and in the crowds, be they residents or tourists, can enjoy processions of up to six hours. Once the procession ends the festivities usually continue in the surrounding streets with dancing and music.